correct as of 2 September 2015.
correct as of 22 August 2010. Josevata Taliga "Joe" Rokocoko (pronounced , born 6 June 1983) is a professional New Zealand rugby union player. 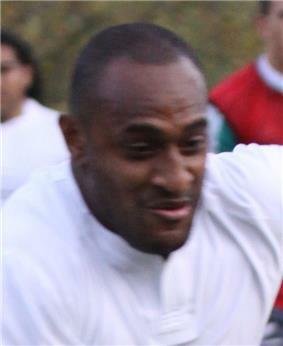 Rokocoko is known for his speed and strength which has accounted for his prolific try strike rate. He is a specialist left-winger but has occasionally played on the right wing for the All Blacks. Born 6 June 1983 in Nadi, Fiji, Rokocoko migrated to New Zealand with his family at the age of 5, settling in South Auckland and he attended James Cook High School. He later won a scholarship to Saint Kentigern College, where he was a member of the 2001 National Secondary Schools team. After an outstanding career with New Zealand international sides at the under-16, under-19, and under-21 level, he started playing Super 12 rugby. Rokocoko scored his 100th First-class try against the Force in the 2010 Super 14 season. He has scored 47 tries for the All Blacks, 19 for Auckland and 40 for the Blues. ^ Jan de Koning. "Joe Rokocoko – An ace up the Blues' sleeve". Rugby World. Retrieved 30 January 2006. ^ "What the Kiwi gossip mags say".